It is our belief that wearing a handmade beaded lanyard makes your workday and little less boring. Wouldn't you agree?! Whether you are feeling fun and flirty or sophisticated in mood, either one of these black beaded ID lanyards will pair beautifully with how you feel. Get ready to show your ID in style! 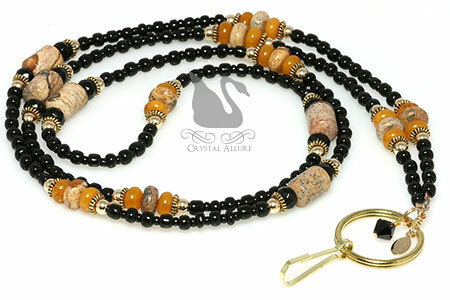 This sophisticated autumn lanyard design features both brown jasper and beautiful amber gemstone beads, black glass beads, 14 karat gold fill beads, gold twisted ring spacers and a single black jet Swarovski Crystal dangle. Comes with a 24mm gold key ring, lanyard hook and finished with our gold jewelry tag. 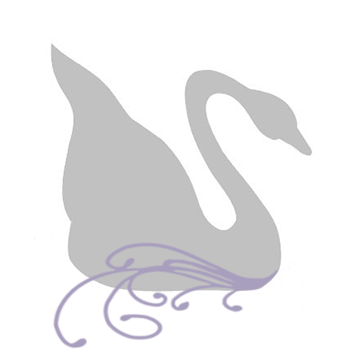 Length is 18-1/2" long including key ring and badge hook. This fun and flirty handmade beaded lanyard can accommodate your badge, ID and/or carry your keys. Colorful butterflies are the focal point of the black matte glass barrel bead with white spots on the sides. The black and white theme is carried throughout the rest of the lanyard with black and white glass seed beads. Finished with sterling silver bead accents, silver key ring and lanyard hook. Measures 18-1/4" long; 36-1/2" around the neck.